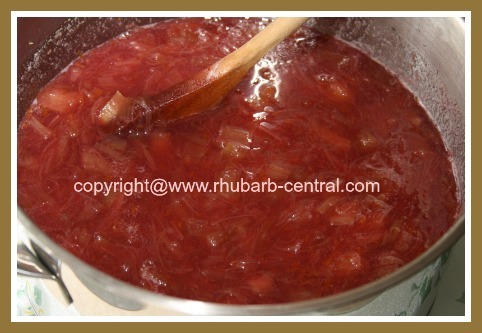 Rhubarb Freezer Jam Recipe - Fresh Jam for Rhubarb Lovers! 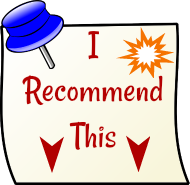 Looking for a Homemade Rhubarb Freezer Jam Recipe that is a quick and easy jam to make? 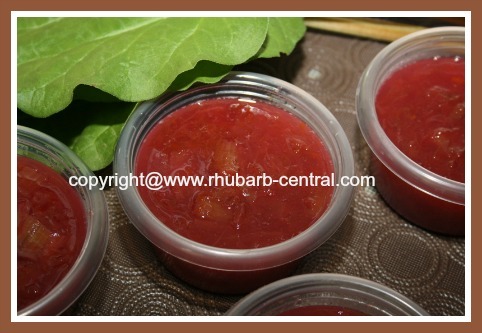 You have found the choice fresh rhubarb jam recipe here! 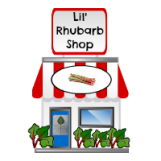 Plain and simple jam for rhubarb lovers! 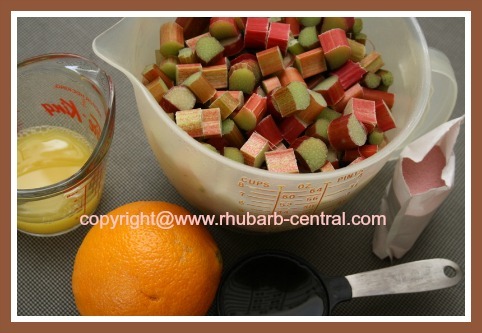 The orange juice and orange zest combine with the tartness of the rhubarb to create an amazing natural sweetness. I altered this recipe recently and added the flavoured gelatin ("Jello") and the low-sugar pectin to give the jam a thicker consistency and a beautiful deep red colour. Here is how to make this delectable rhubarb jam. 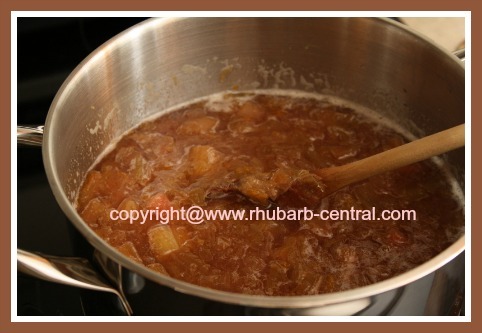 For an even thicker jam, combine the fresh rhubarb and sugar in a bowl, and allow the mixture to sit for about 3 hours prior to making the jam, and then omit the water ingredient. (above) What you need to make Rhubarb Freezer Jam (plus 1/2 package of pectin crystals). 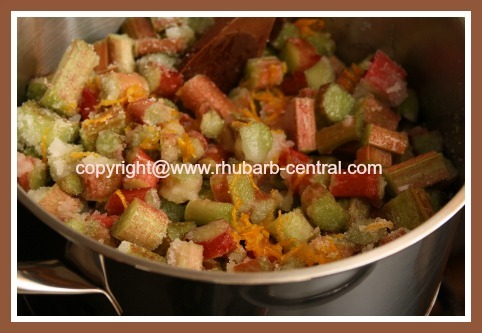 In a pan, combine the chopped rhubarb pieces, granulated sugar, orange zest, orange juice and the water. Bring the mixture to a full boil, stirring often to help prevent sticking and burning. Reduce heat to medium-low and continue to cook the mixture for 35 - 40 minutes, or until the mixture has thickened, stirring often to prevent sticking and burning. After about 40 minutes slowly add the 1/2 pkge. of pectin and stir well to combine. Allow mixture to boil for another 3 minutes. Slowly, while stirring, add the flavoured gelatin and mix until well combined. Pour jam into freezer-safe containers or canning jars, leaving about a 1/2" - 1" headspace and top with lids. Allow fresh jam to stand on the counter until cooled. Store jam in freezer, or store it in the refrigerator for up to 4 weeks ... but it will most likely not last than long if your family likes rhubarb like ours does! 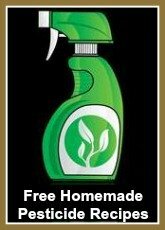 Makes about 6 cups / 3 pints or 48 oz. of delicious jam! 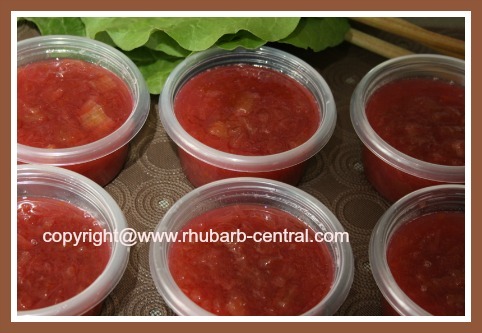 This freezer / refrigerator rhubarb jam makes a great topping for ice cream, pudding, cheesecake, and yogurt too!